Having had 7 new Honda scooters since 1990----all, as they aged had the non shiney plastic start to turn lite/white with age. I have tried various commercial products with varying success. None great, including WD 40----first rain and they all seem to wash off. New discovery: fresh motor oil on rag, rubbed on works well and seems to last. My bike after recent trip to NS----had dust, maybe salt spray from ocean, lot of fine powered dust from construction zones. Of course washed scooter----then gave the non-shiney plastic, including my near 20 year old GIVI box, the oily rag treatment...with fresh oil. Regular plastics get Lemon Pledge. At 36,000 miles bike looks fresh and new. Treatment did not cost much. I'll be out of the loop for a few days. the way I read the forum-----it says "new subject" sp I push the thing----to me it says nothing more, so I do it.....and I am riding. Maybe some computer geeks can make it simpler for people like me who are interested more in riding/the machines then "form and format." John, quit whining you don't know how to do something I taught you to do in PMs years ago. If the posting procedure were any simpler dogs cats and maybe even hamsters would be posting too. The forum format caters to simplicity, not stupidity, so stop acting that way. I think any post John makes in the wrong section should be simply deleted. If it continues to be important to him to post here he will learn. Tough love. He understands nothing else. A know a guy that wiped all his vehicles down with karosene. He swore by it. Because they use so much salt on the roads here in the winter, I brush new oil on the lower parts of my car. Looks like crap. But once the winter starts it doesn't make much difference. 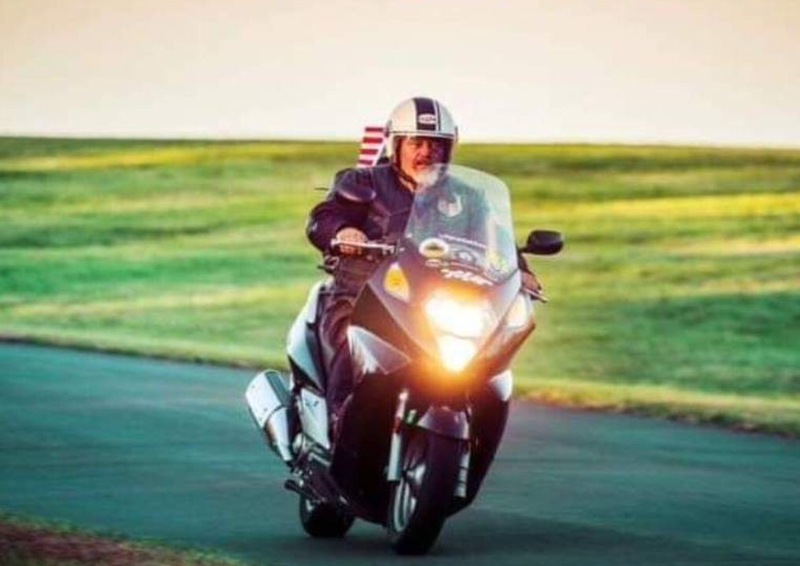 300,000 scooter miles is a lot of experience. Not sure if I have 400,000 miles on any single form of conveyance, or perhaps even in total. Two conclusions: (1) that's impressive mileage, and (2) I need to get out more. I use Original Amour-All on the non-shinny black plastic. Motor oil will attract dirt and dust which will build up with each additional application. The oils will eventually rub off on to your riding gear. I use Pledge Original Lemon on all shinny plastic including my GIVI AF windshield and top box. I use mild car wash soap. I use Autoglym Bumper Care and find it easy to apply. Ya wanna keep your scoot lookin' good? Lemon Pledge. Works great, cleans and gleams and smells good too. It's also cheap. Good for the whole scoot including the windshield. I've been using Plastex since my Helix days in the Nineties, nice shiny finish on the Tupperware and two or three quick polishes a year are enough. A can lasts for years and I've got a couple of spares. Another product I've been using for years to keep winter salt corrosion at bay is S Doc 100 Corrosion Protector, it sticks to metal like **** to a blanket. There's no rust on my main stand and it's coming up to my sixth winter. Of course from my own experience, making the effort to hose down the Silver Wing to neutralise road salt with cold water after riding on treated roads is ultimately more important than relying on any aerosol spray. The absolute best thing for plastic and the only thing I will use is 303 aerospace. It's not a miracle cure for shot plastic but it will keep plastic looking new pretty much indefinitely. The best thing for self-coloured Bumper-type plastic is smooth peanut butter - I kid you not! Alternatively, use a paint stripper heat gun and melt the surface layer VERY CAREFULLY. It will re-colour like new. Practice on old and faded garden furniture first. Hmm...Peanut butter & a heat gun. Sounds like a mess to me. Have you ever wondered about that influx of furry critters swarming your bumper? I don't think I'd be going anywhere near the black plastic parts of my Silver Wing with a heat gun with red hot heating elements especially around the fuel cap area. It may be "safe", but petrol vapour does vent from there, I read an article many years ago where researchers checked fruit and sandwiches that had been stored in a tank bag of a motorcycle for a few hours. Analysis of the food revealed it'd absorbed all sorts of nasties from the fuel tank below it. Anyway I digress, why waste good peanut butter, and our American friends might mistakenly use peanut butter and jelly, the favourite sandwich they used to brown bag to school. A squirt of ArmorAll Protectant Semi-Matt and a quick buff cleans off boot marks from tunnel effortlessly. Doesn't shine the black plastic up too much like other products that make it nigh on impossible for Velcro to stick. ... I read an article many years ago where researchers checked fruit and sandwiches that had been stored in a tank bag of a motorcycle for a few hours. Analysis of the food revealed it'd absorbed all sorts of nasties from the fuel tank below it. Some die-hard petrol-head bikers might say it added to the flavour! I'm all out of peanut butter just now but I've tried ArmorAll and it's okay. The best stuff I've found is Carlube Multi-Purpose Silicone Grease. Rubbed in with a cloth, it lasts for quite a while despite washing and rain. It's also good on brakes and many other things. Not easy to find in the shops, but I usually order a couple of tubes off eBay. "Back to Black" is a product made by Turtle Wax. Works great on the plastic covers. The shiny stuff, I use Lemon Pledge for an immediate shine, but if I want to clean and wax for good protection, a car paste wax on the shiny plastic works great and lasts a long time. I use Lemon Pledge on all of my motorcycle windshields. It lasts good for a week or so. Takes 2 minutes to use. $3.99 a can. "Color Back" by Turtle Wax will work pretty good too on discolored / faded painted surfaces. Mice love peanut butter. Draw your own conclusions. Right on! I've used Mother's Back to Black for years on my land vehicles. That and Lemon Pledge for a quick, inexpensive shine. Works well on the tupperware and windshields as well. Lemon Pledge worked well on my aircraft in Alaska. Made that layer of mosquito goo come off easily and helped make the spray run off the windshield of my Lake Amphibian. Pledge and a couple rags, one for applying and one for buffing would make my old Goldwings shine like new. Worked for the Silverwings too. As the 'riding seaon' draws to and end for a lot of owners, are we now into the 'polishing season’? Iusually only clean my Silver Wing when it gets dirty, but for these winter months I'll make the effort to hose down and clean it after every ride, assuming the Highways Department gritters have been out salting the roads. Usually I don't feel like doing it because it's getting dark, it's already dark and the temperature is dropping, and I'm a lazy old git. I may be a lone voice here, but isn't polishing the Tupperware a job that only needs doing 2 or 3 times a year? A quick spray of the polish of your choice, then another quick buff with an half an old rally or rock band T shirt that you've had so long, you'd now need tyre levers to get it on. Or a squirt of something to remove the boot marks off the tunnel. Usually after you've washed and dried the scooter. It's not a major detailing exercise, just a few minutes work with the spray and a cloth before you push the beast back in the garage or throw a cover over it. I'm also certain if you're in a cleaning mood and have the time to be prancing around with a can of that Lemon Pledge and rags from that old REO Speedwagon T shirt, your lady wives would certainly find you gainful employment around the house. As the 'riding season' draws to and end for a lot of owners, are we now into the 'polishing season’? ... I'm also certain if you're in a cleaning mood and have the time to be prancing around with a can of that Lemon Pledge and rags from that old REO Speedwagon T shirt, your lady wives would certainly find you gainful employment around the house. I got drenched yesterday evening riding in The Wirral and North Lancs. Returned home on the M6 amid the spray of HGV's in the dark. Tired and hungry, I left the SWing outside overnight - and this morning in the rain. I put a cover over the seat and intend to hose any salt off from underneath when the rain eases. I may even sponge it off at some point - but probably not... it won't dissolve in my lifetime. Sewing? I'm still using the army sewing kit or 'housewife' I was issued back in 1966. The olive green pouch is getting a bit tatty now, of course I've added and replaced stuff over the last 50 years, and I can still thread a needle by the third attempt. Cooking, I do most of it in our house, I make and bake all our bread (by hand now, since my brand new expensive mixer lasted less than 3 years), push the Hoover round, flit round with a duster, window cleaning, cutting the grass, do the bins and recycling, errands and shopping on my Dutch push bike, etc. Single or married, someone has to do it! I feel for you guys that have a winter. In FL riding season never ends! I don't find it as bad as you might think. We don't ride for transportation. Not to say someone won't ride to work in the summer. But once the cold weather is here and snow flying I do have any urge for the bikes. I just forget about them out there in the garage all covered up. But then the first nice day and that excitement of first getting a bike comes back. Then we ride the hell out of em all summer. I guess it's just all what you're used to. The thought of putting my bike away for months out of the year makes my soul sad. Unless your into some winter sport, I find being trapped indoors the worse. Also the pool water gets kind of hard. Really miss the pool and a few beers. It's amazing what one can get use to. Don't on my account, I find the humidity of Florida and similar climes unpleasant, and I'd easily get bored with all year round sunshine. I feel for you. ...Single or married, someone has to do it! And let's just say I have more kitchen tools than the average housewife... tools like a soldering iron, a dremel, a worktop clamp, and I just bought some smooth peanut butter to try on the plastics. All can be found in my kitchen. PMS = Parked Motorcycle Syndrome. Isn't PMS = Premenstrual Syndrome? The Silver Wing is a maxi scooter not a motorcycle, and the only motorcycle mentioned in this topic is that Interstate drone, the Gold Wing... again. Not surprising that Goldwings would be mentioned. There are quite a few of us who came from Goldwings to the Silverwing. I was hoping that the Silverwing would be as reliable and trouble free as a Goldwing which is one of the most reliable and long lasting motorcycles ever. I wasn't disappointed with the Silverwing, it is indeed the smaller brother of the big Wing. One of the most reliable and trouble free of maxi scooters. By the way, the big wing isn't a drone, it's nearly silent at highway speeds. Thank you, it's a gift we Meldrew's are famous for. Don't you have the summer months which are pretty unbearable, comfort wise for riding much? Well, I would have to give the little brother to the Honda Pacific Coast. The Silverwing is a class of it's own, being a maxi scooter. If you want to use PMS = Parked MAXI-SCOOTER Syndrome, you are more than welcome to. Or if you wish to use PMS = Parked Motorcycle Syndrome, you are welcome to. Some motorcycle enthusiasts enjoy having more than one type of two wheel vehicle. I own a Goldwing, a Silverwing, a cruiser and a PCX 125. I think the Honda Helix would qualify as a "little brother" to the Goldwing. 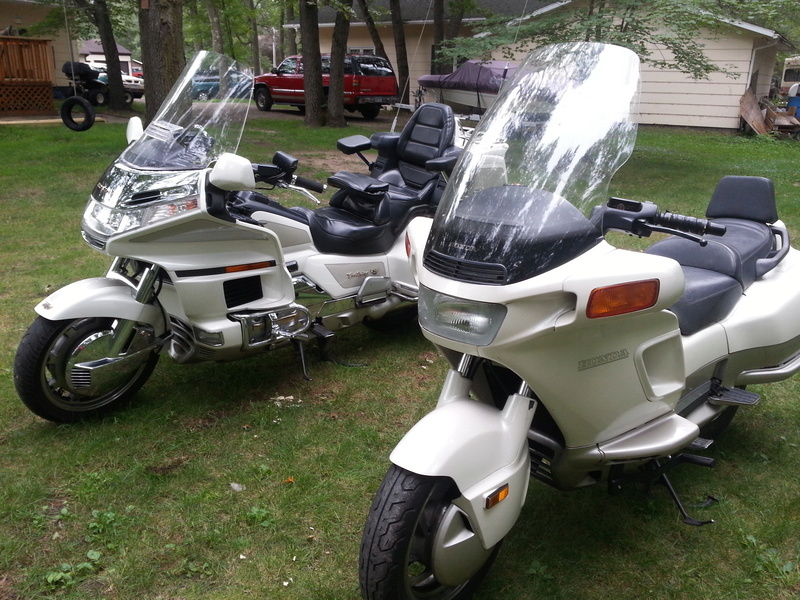 I have never owned a Honda Pacific Coast, but it appears to be the best match for a "little brother" to the Goldwing. I have always wanted to buy a Pacific Coast and give it a good trial, but most of them now have a billion miles on them and they are still bringing a good price compared to other bikes. Why does a Pacific Coast bring more money than a ST1100? Now guys/gals. The topic of this post is CHEAP DISCOVERY. Boy was this thread hijacked. Digressed is a better term. Threads do have a tendency to wander around a bit. I suspect that some of us having survived many winters tends to cause a bit of that . I just sold my '89 this past summer. I think I got $2,800 for it and had 40k for mileage. Like the Gold Wing, the Pacific Coast is very quiet to operate, one can barely hear the motor run. The Silverwing is a relative noisy bike comparatively speaking. Both the PC and the Silverwing have storage, much like the Gold Wing. I always thought that the PC800 kinda looked like big-assed Helix from the rear. But overall it reminded me of a Vincent Black Prince. Location : Virginia near D.C.
One of the most entertaining threads ever! Tim, I enjoyed the 89 and the 92 PC800's I owned, The large trunk and the passenger seat would hold enough for a two week trip. Of course my bikes were equipped with Bridgestone tires and 100MPH interstate cruising was very smooth. The Extra coverage windshield available in the Honda accessory catalogue got rid of all that wind buffeting and made for pleasant Hi Speed riding. The only thing I always disliked about those V configured engines was the uneven Harley like Idle, Over the years I tried many remedies to that condition, Finally selling those bikes and going back to the Silverwing type engine. The about 100,000 Miles on the PC'S was largely trouble free, Many long extended trips over the years. I would like to redo some of the things I did when I was younger.